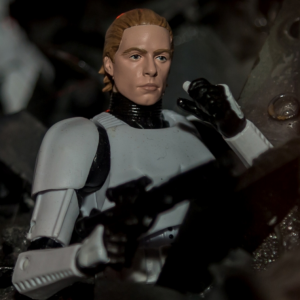 Jedi Temple Archives has posted their latest rumor/leak for the 6″ Black Series line. Looks like we’ll be seeing a couple more prequel era figures in the not-to-distant future. Head on over to check it out. Rumor Report: Black Series Titanium Helmets Now Exclusive? Yesterday we received a tip that the Black Series Titanium Series Helmets, that were thought discontinued (due to their lack of leaking) are rumored to be exclusive to a big box chain. An image has surfaced on social media from the stock room of said chain this afternoon which may in fact confirm this rumor. It was inevitable but as we come closer to Force Friday more and more items are starting to hit retail and now eBay. A simple search for “2017 Star Wars Black Series” will yield confirmation of Wave 2’s figures. Now the question is: what will their availability be like come September 1? We shall see…. we shall see. As we speculated a couple days ago with our exclusive reveal, we can now 100% confirm that there is a new blue and white Resistance A-Wing (with no Nerf) coming for The Last Jedi. It includes the Force Link play feature as well as a female pilot in green flight suit named Tallie. The packaging also confirms our rumor of a new two pack which we teased here. Per our report, the A-Wing should retail for $29.99 and the two pack should be $14.99. SDCC 2017 Reveals Rumored Trash Compactor Luke? Rebelscum captured a great shot of this wet-haired 6″ Black Series Luke Skywalker that supports our rumor from 2015 regarding a possible Trash Compactor scene with that particular Luke. Stay tuned throughout the weekend to see how/if this pans out. Jedi Temple Archives has posted a breakdown of some of the rumored items that will be available from Hasbro for the “Rogue Friday” (aka Force Friday) launch on September 30. Since our last show, rumors have “gone Rogue” regarding the first waves of 6″ Black Series set to launch on Force Friday 2.0. Reports of 6″ Ahsoka figure sightings are becoming more prevalent as well as the appearance of the Kmart Exclusive Rey figure. New lists of Funko POP! figures have leaked as well with huge support for Rogue One characters. All of this plus Sideshow, Disney Elite, LEGO, Tsum Tsum news & reveals and much more including our latest acquisitions on Episode #94 of The Realm Recap. Our friends at Jedi Temple Archives have deployed a mechanized rumor report regarding the next vehicle to get the “BMF” super-size treatment. Head on over for their report and then sound off in our forums on what you think of this possible release. UPDATE: For those curious about those 20 included battle droids that is kind of a red herring as only 4 of them are poseable, the rest are preposed in their collapsed/storage mode. You can read this for yourself here as well as view a small image.